1. Why were London theatres closed in 1593? 2. What was the name of Shakespeare's theatre and who built it? 3. What type of play was Richard II? 4. Which Queen reigned during Shakespeare's time? 5. What was the main type of poem that Shakespeare wrote? 6. How many sonnets did Shakespeare write? 7. What type of play is Romeo and Juliet? 8. How much did it cost to see a play in Shakespeare's theatre? 9. What type of Shakespeare play always has a happy ending? 10. Where and when was Shakespeare born? Let's see how quickly we can answer these questions together. Once all the questions have been answered, have a look at the challenge below. 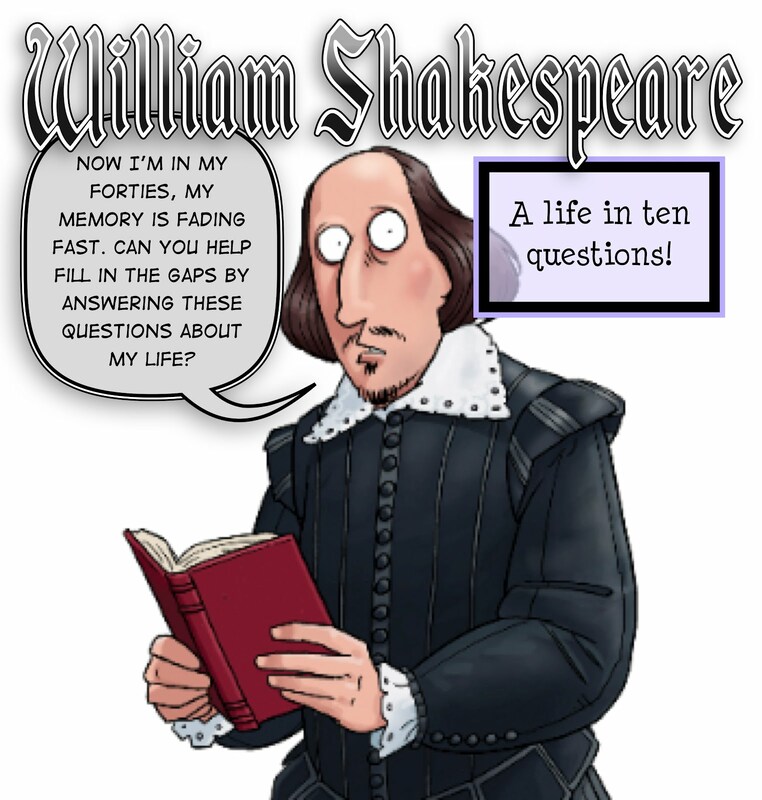 Blog the most unusual and interesting fact you can find about William Shakespeare. In 1593 theatres closed due to the bubonic plague (the black death). Nobody wanted to go to the theatre in case they caught this disease from other people. Well done Assia. You have answered question 1 correctly for us. Can anyone answer the next question in the quiz? To answer question four it is easy. England was ruled by Queen Elizabeth I during Shakespeare's time. She ruled from 1558 until her death in 1603. After that, King James I ruled, known as King James the IV in Scotland. Correct Al-Baraa, question 4 has now been answered. Richard II was a historical play, written in 1595 by The Bard. Well done Fathia, question 3 is answered everyone. Now blog a short summary of the story Fathia. Richard II is a king who stopped Henry Bolingbroke (who would eventually be Henry IV) and Thomas Mowbray (Duke of Norfolk) from fighting. Here is the plot. Henry accuses Thomas of embezzling the crown funds and plotting the death of his uncle, the Duke of Gloucester. This is when Richard stops them. Henry is exiled for ten years, later reduced to six; Thomas is exiled for life. John of Gaunt (Duke of Lancaster, uncle to the king and Henry's father) dies after accusing Richard of improper government. Richard orders the seizure of John's property, denying Henry his inheritance. He then leaves his for Ireland, appointing his other uncle York to govern in his absence. The Duke of Northumberland reveals that Henry has returned to England with an army. Henry persuades his uncle York that he has returned for his rightful inheritance, not to start a rebellion against the crown. Richard returns from Ireland to discover that his Welsh troops have deserted him, that York has allied himself with Henry, and the common people are rising against him. Henry and his supporters meet with Richard. Henry promises to surrender his arms if his banishment is repealed and his inheritance restored. Richard agrees to his demands. Richard's cousin, the Duke of Aumerle, is accused of murdering the Duke of Gloucester. Henry arrests everyone involved in the allegations. Richard agrees to re-announce the throne . Henry announces his coronation. A plot is hatched to restore Richard to the throne. York discovers that his son Aumerle is involved in a plot to kill Henry. Aumerle confesses to Henry, and is pardoned. Richard is killed whilst imprisoned in Pomfret Castle. Henry receives news of his supporters' efforts to defeat his detractors. Exton presents Richard's body to Henry, only to be rewarded with banishment. Henry promises to undertake a pilgrimage to make amends for his sins. Shakespeare wrote 154 sonnets and 37 plays. Is Ellie correct Year 4? Have we answered question 6? What is a sonnet Ellie? A sonnet has fourteen lines of any tipical rhyme. I want to know exactly how much it cost Esther! 5. Shakespeare wrote poems mostly sonnets. it is really called the globe. Before John Shakespeare became minister of Stratford up on Avon he use to be a merchant and sold merchandise like leather goods, malt, cotton and clothing materials. John Shakespeare use to like dabbling a lot. Shakespeare ripped off Romeo and Juliet. Originally, it was called Romeus and Juliet. If you can tell us what kind of play Romeo and Juliet is Fatiha, we will have answered question 7. Romeo and Juliet was a tragedy. Even though it was romantic, Romeo and Juliet both died. It was also one his most popular plays and along with Hamlet, is one of his most frequently performed plays. Yes Malika. What was the name of the company of actors who helped Shakespeare build the Globe? Shakespeare died of drinking pickle juice and eating picked herrings with his friend, but his friend didn't die. For The Challenge Qestion.He was born at Stratford-upon-Avon, Warwickshire, England.He was Baptised on 26 April 1564.He Died On 23 April 1616 at Stratford-Upton-Avon, Warwickshire, In England.For Drinking To Much Wine. And Was Only 52! I think the interesting fact here is that he was only 52 when he died. Well done Matthew. 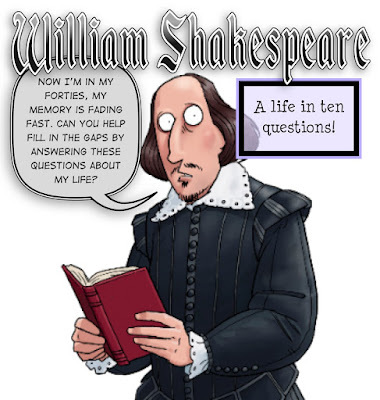 Year 4, I wonder who can find the most obscure or funniest fact about the life of William Shakespeare. And was born at 1564'26th of April. 2. The Globe Theatre was a theatre in London with Shakespeare. It was built in 1599 by Shakespeare's playing company, the Lord Chamberlain's Men. Correct Konrad, question 2 has now been answered by you and Al-Baraa. The Globe burnt down in 1613, can either of you tell me how and why? Also tell me when the theatre was rebuilt and who did it. You needed to pay 12p to sit down because you can In joy your self and eat apple while your doing it at the same time. it will be so fun. But some people could not sit on a chair because they didn't have that much money to buy to sit on a chair but they could steal eat apple though. 10.Shakespeare grew up in Stratford and went to a grammar school were he learned Latin, Greek and History. Question 10 has now been answered by Matthew and Shayla's answers. Who can answer question 9? some of shakespears story was happy and joyfull and some were very sad and emotional. also some were about drama. Here is my fun fact about Shakespeare. In Tudor times, his plays were performed only in the afternoon (when it was daylight). Can anyone guess why? They only performed them in the afternoon because they didn't have light so they needed thousands of candles and they didn't have electricity. I think you mean candles Deborah. Shakespeare did not have any decsendents of his family because his eldest daughter Suzanna died in 1760 and she had no children in las or desendents of their family. Mary was called bloody Mary because she executed lots of people. One of Shakespeare's most famous poems is '' you love animals but you eat them you say you love the rain but you catch a cold and now im scared because I don't know if you really love me''. did you now that henry the eighth chopped of his six wifes heads of becuas he dident have a baby boy he ceepded on getting a baby girl but on the last wife he got a baby boy. Eighteen of shakespeare 's are usually among the comedies ; comedy of errors,Taming of the shrew, The two Gentlman of verona, Loves labours lost. Shakespeare wore an golden hooped earing. It was a sign that he was creative and artistic. Did you know that every day when William Shakespeare he gets his book (what he writes his stories with) and dose a lot of writing through out the hole day or he dose comedy shows on stage in the home town thearter. Did you know that there have been many different ways that people have spelt Shakespeare, including Shakespear, Shakspere, Shaxspere and Shaxper. What quotes from Shakespearean plays do you find the most interesting? “To be, or not to be. from hamlet is a quote from one of his plays . Hamlet is a tragedy . William Shakespeare such as to be "O Romeo,Romeo! Wherefore art thou Romeo"form some of litertur's most celebrate lines. divorced,beheaded, died,divorced, beheaded and survived. Catherine of Aragon divorced. Anne Boleyn beheaded. Jane Seymour she died. Anne of Cleves divorce. Cathreine Howard beheaded. Catherine Parr survived. Why did ]you choose that quote Tofe? Can you find another which means something to you personally. Mr Highman a quote that means something to me is:out of mine sight! Thou does infect mine eyes! people were punished with death often by hanging or beheading, although in some cases punishment was less severe. Punishment could include whipping, starvation, burning at the stake, dismemberment, hanging, the pillory, and branding. I like the one that says have more than you show speak less than you know. Super quote Hafsa, where is it from? What does it mean to you and why is it so special? If there was a part of a girl then a boy would have to dress up because girls weren't aloud to be in plays. His greatest plays include, Hamlet, King Lear, othello, Macbeth and Romeo and Juliet. The romatic poet John Keats kept a bust of Shakespeare. On William Shakespeare's grave there is a curse on it which says [good friend for Jesus sake forbeare,to dig the dust enclosed here.Blessed the man that spares these stones,and cursed be he that moves my bones]. William Shakespeare,s mother was a daughter of a farmer and his father was the mayor of stratford. Mary Shakespeare never learned to read or wright. william shakespeare die because of mystery and he was drinking to hard a william shakespeare die in the year of 1616. Shakespeare wrote a curse for his gravestone. It was a curse on anyone who dared to move his body from that final resting place.